Yesterday was….interesting. Russ and I had to go get some grocery shopping done so we decided to brave the snow and hope for the best. Mannnn, were we naive! First off, my car (his is totally snowed in and not going anywhere) was parked 1/2 mile away at a little general store that let him park it there. Why was it there, you ask? Because, the other day when he tried to get up our 1/4 mile driveway, he got stuck. Some kind strangers pulled my car back out to the road and he drove to the store and asked to keep the car there. Thank God for small town hospitality. Anywhere else would have had it towed, but they let him leave it there. Sooo… we traipsed through the foot high snow, me in just a long sleeved shirt and a sweater, because I don’t own a coat and I don’t have gloves because the boys played with them and lost them. Did I forget to mention that it was 6 degrees with a wind chill of -2 out when we did this? You may now groan and feel pity for me. I’ll take the sentiment gladly. 😛 So, we got to the car, got to the main road, which was clear and made it into town, about 20 minutes away. Did our shopping and headed home. It was dark by this time. Now, the stupid part was our hope that we would be able to get the car up the driveway. Why did we think this when not a darn thing had changed since last time? I have absolutely no idea. Call it hunger induced idiocy… cabin fever induced idiocy. Whatever. Well, we made it home. I had Russ let me off at the edge of the driveway so that I wouldn’t make him nervous gripping the dashboard and whimpering as he tried to get up the driveway. Then I slogged through to the house, and since I heard NO car following me, I grabbed a flashlight and went straight back out. By now the temp was about -1 with a wind chill of “Oh, crap, I can’t feel my face.” I made it back down to the car, which was stuck (gee, imagine that) about 30 feet in. We tried to get it out; no luck. So Russ went over to our neighbors house (the driveway belongs to both of us, with their house being up front near the road and ours way back). he has a truck, so we begged for him to chain us up and pull us home. He agreed. BUT… of course there is a but here…. he managed to get us about 35 yards or so from the house and that was it. He was afraid of getting stuck himself if he went farther in. So there we were; a trunk and back seat full of groceries at a distance that, at that moment, seemed like far enough to qualify as being in another state, with about 352,000 bags of groceries to get in. Uphill. Both ways. Did I remember to mention that it was about -400 with a wind chill 0f -2000? It seriously is uphill getting to the house though; thus one reason the neighbor was afraid of getting stuck. So we managed, after about 4 trips each, crawling on our hands and knees, as polar bears snapped at our heels to get the food and the blizzard raged around us (Yes, yes I AM planning on writing a nice fantasy story. Why do you ask? ), to get the groceries back to the house. I have never been…so cold…in my life. Sweater, hat, no gloves, sneakers that held out not one bit of snow or cold. My poor feet and hands threatened to divorce me and find another body to live on if I ever did that again. I didn’t blame them. These quesadillas were nice and warm however. Both heat wise and spicy wise. Right now, I so love the words warm and heat. If I had a raw habanaro in front of me, I’d eat it just to embrace the inner heat. These are crispy crunchy on the outside, cheesy and chickeny (think I’ve used enough c words now?) inside with wonderfully browned onions and peppers. Plus, there is a touch of heat from the jalapeno. Nothing major though. These are also extremely easy. I have it set for three servings but this is simple to change amounts on. Love…. Mrs. Cupcake… who will never be warm again. 3/4 to 1 cup shredded Colby jack cheese. Slice your onion in half, then cut it into thin half moon slices. Do the same with the green pepper. Pour the 2 tablespoons oil into a medium non stick pan. Add in the onions, green peppers, jalapenos and garlic. Cook over medium heat until the onions and peppers have gotten soft and browned, about 5 minutes. Put in a bowl, cover and set aside. Heat the sliced chicken in the same pan and heat just until warm. Set in the bowl with the veggies. Leave the pan over the heat while you prepare the tortillas. Brush one tortilla lightly with oil. You don’t want it dripping but you want enough on there to help crisp the tortilla. Lay it in the hot pan and immediately top it with a third of the veggies and meat and the desired amount of cheese. Sprinkle lightly with salt and pepper. Top with another tortilla and carefully brush that one with oil. Carefully slide a spatula under the bottom and lift to see if it is as browned as you want it to be. If so, carefully flip it over (hold the top one lightly with your hand as you flip) to brown the other side. Cook to desired doneness, remove to plate and cut into 4 wedges. Repeat with the other tortillas; serve with sour cream, salsa or picante sauce and some green onions. 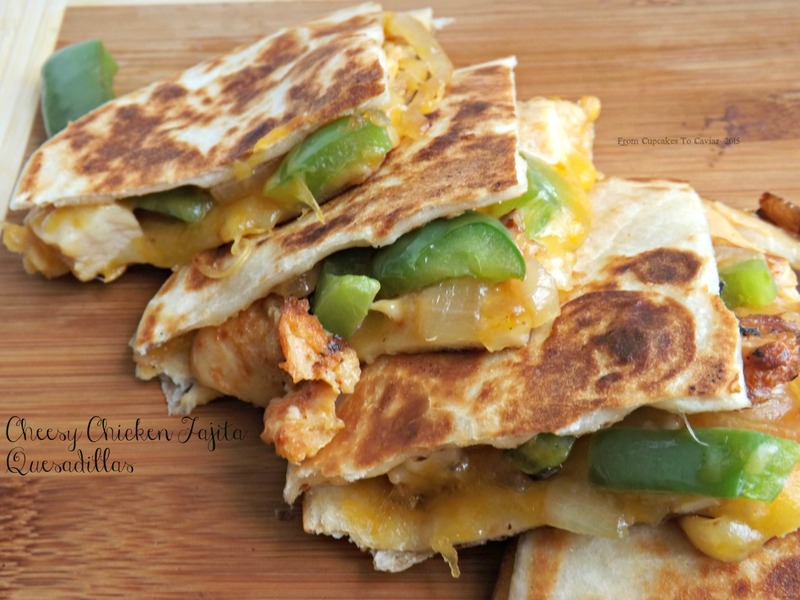 This entry was posted in Cheese, Chicken, Easy and tagged cheese, chicken, easy by Janet. Bookmark the permalink.